As the largest of the Greek islands, with lots of hidden gems to uncover, the best way to experience Crete is by renting a car and exploring! Wherever you’re staying for your Cretan holiday, if you rent a car in Crete you have the freedom to roam this beautiful island at your leisure and sample some of Crete’s top attractions while uncovering your own enchanting places along the way. 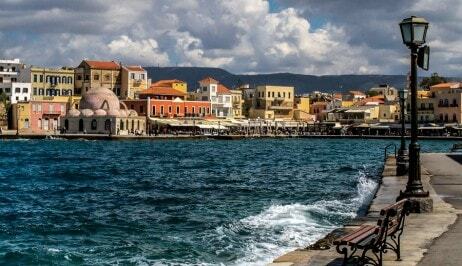 From Crete’s capital Heraklion (where Europeo Cars office is based) and to the east of Crete you can drive around the Lasithi prefecture to the beautiful and picturesque beaches of Elounda, and the resort town of Agios Nikolaos, with its famous lake in the town centre. You can also take a drive to the fabulous Minoan Palace of Knossos. A drive 60km further south from Knossos will take you to the ruins of another of Crete’s Minoan palaces, Phaestos, which can trace its history back to the neolithic era and was the site where the Phaestos disc was discovered, a clay disc inscribed with mysterious hieroglyphics which archaeologists are yet to translate. Driving on from Phaestos takes you to the seaside villages of Matala and Agia Galini. Matala is famous for its stunning sunsets and caves carved into the cliffs, and was a popular hippy destination in the 1960s and 1970s. If you’re staying in and around the fantastic and vibrant Venetian town of Rethymno there are a numerous great places to explore with a car every day. From Rethymno, you can take a magical journey into the centre of Crete via exhilarating winding mountain roads, discovering picture postcard pretty mountain villages and admiring breathtaking natural scenery in areas like the Amari valley. The eastern orthodox Arkadi Monastery is around 20km from Rethymno and is well worth a visit, offering a fascinating and complex history dating back to the 16th century. From Rethymno you can also take some fantastic day drives down to Crete’s glorious south coast, which offers the finest beaches on the island for swimming. The drive over the mountains in the centre of the island and then the descent through the spectacular Kotsifou canyon to the pretty sea-side village of Plakias and the fantastic beach at Preveli is truly awe inspiring. Those based to the west of Crete around the harbour town of Chania have the opportunity to explore Crete’s far western reaches by car, visiting the interesting seaside village of Kissamos, with its calm waters protected by Kissamos bay, and Paleochora on the south west coast, an idyllic sleepy village with a beautiful beach and perfect azure blue sea stretching out to the horizon. Both Chania and Rethymno are a convenient driving distance from the glorious White Mountains (Lefka Ori) and the Samaria Gorge National Park, a very popular destination for keen walking and hiking enthusiasts who can experience an invigorating 13 km hike through the gorge surrounded by a variety of beautiful flora and fauna. These are just a few of fantastic attractions that Crete has to offer visitors who want to explore Crete by car. But the best thing about car rental in Crete is making your own discoveries, and experiencing the island’s stunning natural scenery, beautiful beaches, picturesque villages, and archeological marvels for yourself! Check out our price list for the best Crete economy car rental prices! Special Crete car hire winter offers between 26/09 and 15/05!